The chief executive of the company which owns British Gas received a 44% rise in his pay last year to £2.4m. It means Iain Conn, who runs Centrica, is paid 72 times that of an employee in the lower quartile of its salary range - a smart energy expert paid £33,718. The pay deal comes in what the company described as "challenging year" and after it warned profits this year would be hit by the energy price cap. The energy price cap rose to £1,254 at the start of April. Mr Conn's pay rose from £1.7m in 2017 because he did not receive a bonus that year, while in 2016 he received £4m. 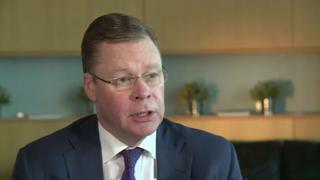 In the annual report, Centrica said Mr Conn had been "reshaping" the company against "the challenge of a constantly shifting operating environment". "Iain has shown significant resilience in the face of this challenge and has led the business through the shifting context, keeping the strategic objectives in sight and ensuring that the organisation remains adaptable and innovative". The company's shares fell to near 20-year lows after the warning in February that profits would be knocked by Ofgem's price cap, amid fears it would cut its dividend. A year ago, Mr Conn announced 4,000 job cuts, while British Gas has lost 742,000 energy supply accounts, as it rarely appears among the cheapest deals on price comparison websites when customers look to switch suppliers. It said this represented a reduction of between a half and a quarter in the pension benefit for affected executives and "represents appropriate alignment with the wider workforce". The company also measured Mr Conn's pay alongside that of an employee in the median salary range - £41,239 - which gave a ratio of 59:1, and in the upper band, a technical engineer receiving £55,107 - which was 44:1. Last month, energy company Shell said its chief executive Ben van Beurden's pay was 143 times larger than that of the average Shell employee in the UK.